It was an hour until the keynote speaker at the political rally I was attending in Phoenix, Arizona, was due to appear, and the crowd, many of whom had been waiting for hours already, was jovial. There was the usual happy chanting and banter — and suddenly, the sea of people around me parted. Through the middle walked a woman in a hijab, carrying her sleeping son. Now here is where the story can go one of two ways. At the rallies of one of our U.S. presidential candidates, minorities are distinctly persona non grata. A Muslim woman wearing a T-shirt that read “Salam, I come in peace,” was kicked out of a Trump rally amid chants of “You have a bomb, you have a bomb.” Black protesters have been physically attacked at Trump rallies. A Trump supporter was recently caught on tape screaming, “Jew-S-A!” to the press box at a recent rally. And Trump himself called a black supporter a “thug” and had him removed from a rally, when the man was actually firmly in his camp. These are but a few of a multitude of racially charged incidents that have occurred at Trump rallies. Luckily, I wasn’t at a Trump rally. I was at a Clinton-Kaine rally, and the sea of people was not parting to berate the Muslim woman carrying her child, but rather to let her through to the front. Everyone was moving out of the way so that she and her child could have a better view. 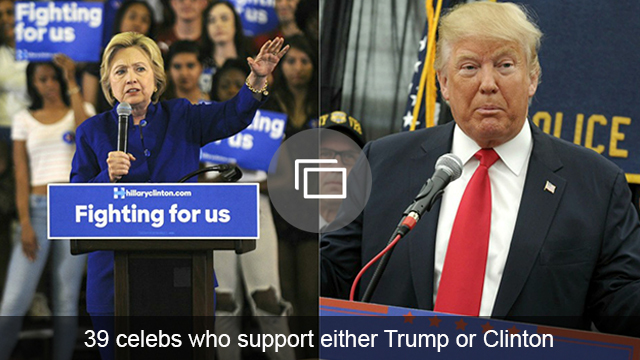 The Republican rallies of this particular election season have become notorious for their hatred and vitriol. Not so at the Clinton rally I attended. The convention hall was positively vibrating with hope and excitement and a shared sense of optimism and purpose. The crowd was a perfect mix of our country’s population: white, black, Asian, Native American, Latino, male, female, gender non-conforming, young, old and in-between. 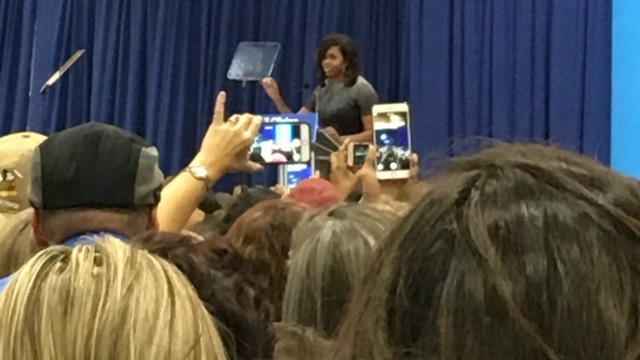 Two middle school-aged girls rode the escalator in front of me, excitedly chattering about seeing Michelle Obama speak on behalf of the woman who could become our first female president. “Do you know how lucky we are?” one asked the other. The woman waiting in line with me, who was black, tells me she left her husband alone with their contractor to finish painting their kitchen, even though she laughingly explained he has no idea how to direct the work the way she would herself. “It’s worth the risk to support our girl,” she said. The retired couple standing on the convention hall floor directly behind me didn’t seem too thrilled about having to stand around for a couple of hours — “how do we get a seat on those bleachers?” they wondered — but they had no problem stepping aside and letting the “young people,” as they called them, cut in front for a better vantage point. Then I saw the other way around, the “young people” ushering their elders into spots where they wouldn’t feel as crowded. But the real magic happened when Michelle Obama appeared. The queen of the positive message, the originator of “when they go low, we go high” galvanized the crowd into even greater kindnesses. The tall people in the crowd were physically taking the shorter people by the shoulders and moving them to the front so they could see better. Those with longer arms were taking the phones of the vertically challenged around them in order to get better photos and video. The woman in the hijab was ushered even closer as I overheard several people tell her they were so glad she was there. 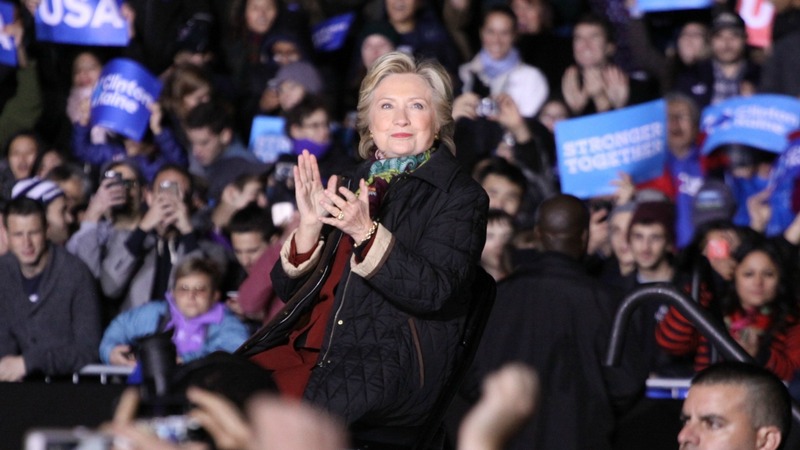 And at that Hillary Clinton rally, it was the America I knew too.